It even comes with new furniture! Santa ate all the cookies and only left some crumbs. Jason & Sophie opening gifts. Sophie playing dress up with her new dora dresses from Grandma Sue. Checking out Santa's plate of cookies. Jason, Sophie and I celebrated christmas with Grammy & Grampy the weekend before christmas. Sophie had the best time playing with Abbey & Macey. She loved the presents under the tree and even decided that she couldn't wait for everyone else to open theirs. Sophie, Abbey, Emmey & Macey...this was the best picture of the 4 of them together. Sophie does not seem to be in too much of a hurry to get better. She is still running a low fever and has had a terrible cough since Tuesday. I took her to the doctor yesterday afternoon, but the doctor said it is just a viral infection that must run its course. We didn't sleep very well last night because Sophie coughed and tossed and turned all night. To make matters worse she decided to get up at 6:30 this morning for a glass of bunk (milk). After watching Sesame Street she took a little nap while sitting in her chair. We spent the rest of the morning sitting in her Dora House reading books. She thinks that is where we need to play now even though it is very crowded with her, me, 6 dolls, 10 books, a blanket, pillow and whatever else she picks up on the way in. Sophie has been sick this week so I got her a prize. Princess slippers! I really got them for her because she doesn't want to wear socks and since she is sick she needs to have something covering her feet. Well, the slippers turned out to be a great idea because she thinks she is something wearing them around. Please notice that we still have a purse in all of our pictures. Sophie's preschool had their christmas program on Monday. The pictures are not that great because we had to sit in the back so that Sophie would not see us. She did not want any part of getting on stage so one of her teachers, Mrs Kathy, had to hold her the entire time. 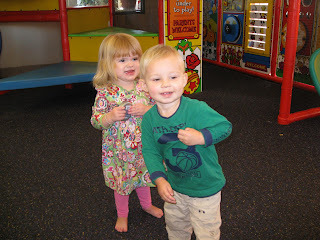 Sophie's class did a poem called "The Twos are Bringing Tidings of Joy." It was a really cute poem that incorporated all the children's personalities. After Mrs Kathy read the poem they played a song and the kids were supposed to dance, but only one little boy danced and he stole the show. She at least let me take a picture of the cute t-shirt they made when we got home. As for the christmas program, oh well, maybe next year. 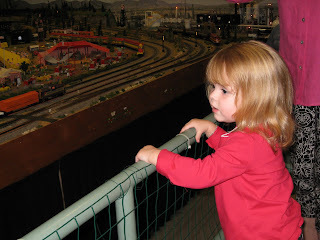 We went to the train museum in Foley to see the model train exhibit. Sophie's friend Maggie, from our playgroup, and her mom Julie went with us. Before we left for the day Sophie let me take a picture of her in front of the christmas tree. Lately, she goes everywhere with that little purple purse, so of course it had to be in the picture. Sophie is in love with trains right now and she thought that this was the best trip ever. She gets soooo excited when she sees a choo choo (she usually calls large trucks choo choos). Which is pretty funny considering that there are no trains where we live. Anyway, the model trains were very interesting. They have put a lot of time into making such an intricate exhibit. They were even having a funeral in the exhibit, which I thought was a little morbid, but the men thought it was humorous because they had one of the women attending the funeral wearing a red dress. One of the men asked us "Now who would wear a red dress to a funeral." Another one of the men running the trains asked if we wanted to see Mr. T (for those of you who are as uninformed in train lingo as we were Mr. T is Thomas the train.....not the 80's tv star with a mohawk and gold chains). I was glad to realize he was talking about Thomas the train, because I was thinking why would two year old girls want to see Mr. T. Sophie's favorite part of the exhibit was when the trains would go through the tunnels. My favorite part was when the men would let the girls blow the train whistles. 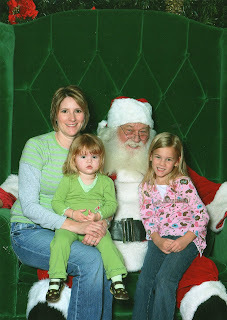 Sophie, Abbey and I saw Santa when we were at the mall the other day. I thought that maybe Sophie would sit in Santa's lap if Abbey was with her, but nooooo she was having no part of it. I was finally able to get her to sit in my lap while I sat in Santa's lap and as you can see from the look on her face she was still not happy about it.